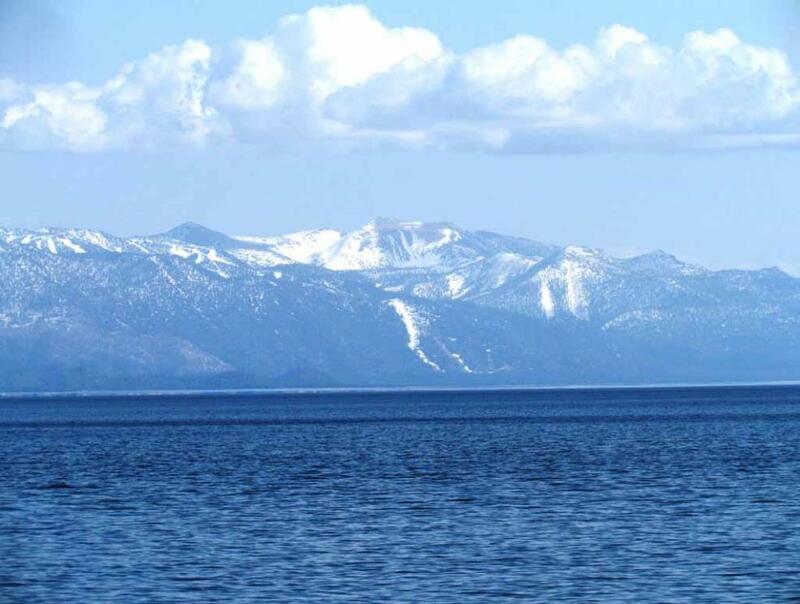 Another view from east shore of Lake Tahoe with snow caped mountains. 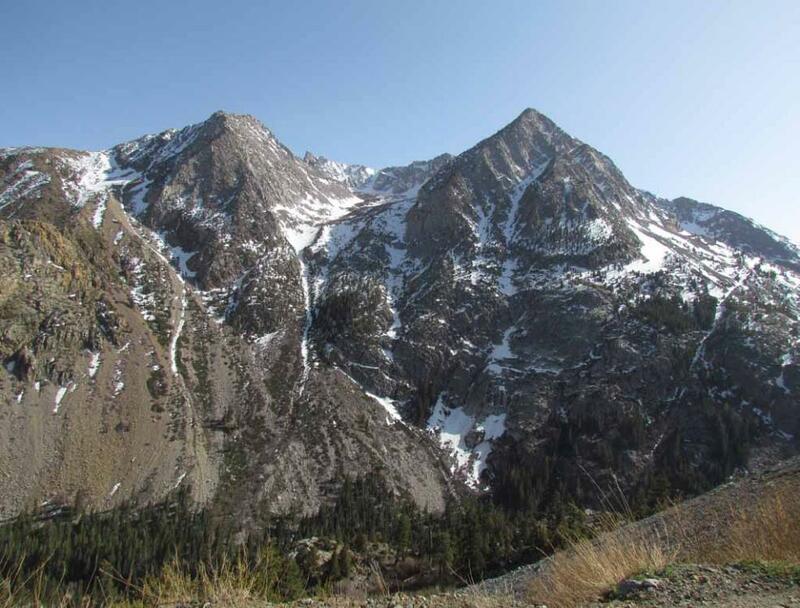 that Eastern Sierra mountains with snow caps look very beautiful and picturesque in April 2012. 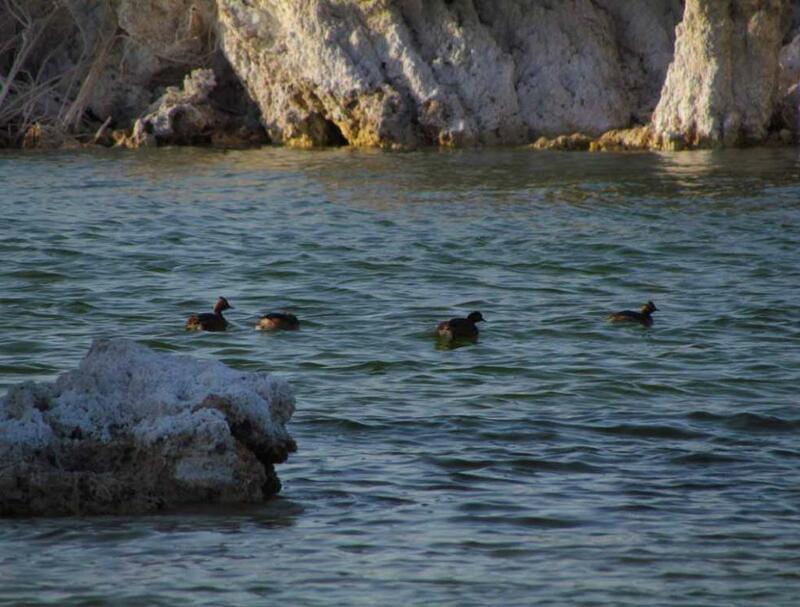 Bay in the afternoon of April 29, 2012. 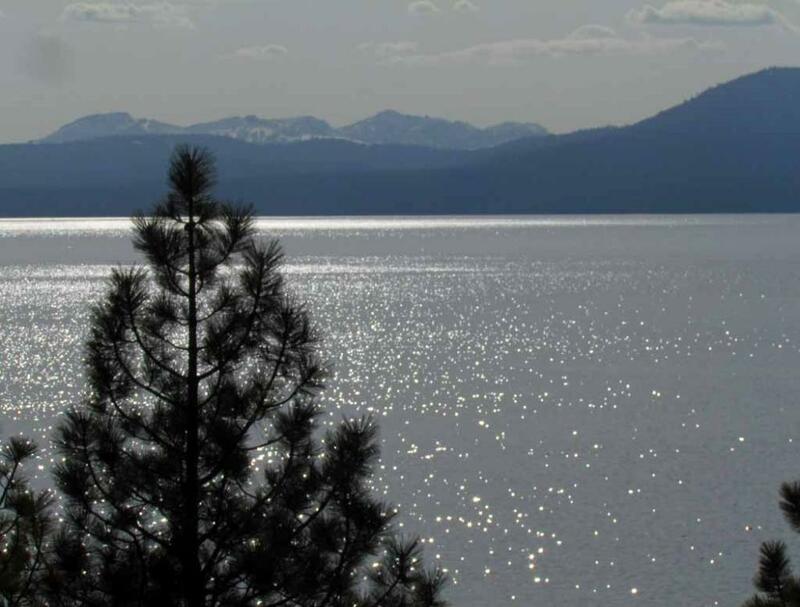 Amazing view in the afternoon from eastern shore of the sun-splashed Lake Tahoe. 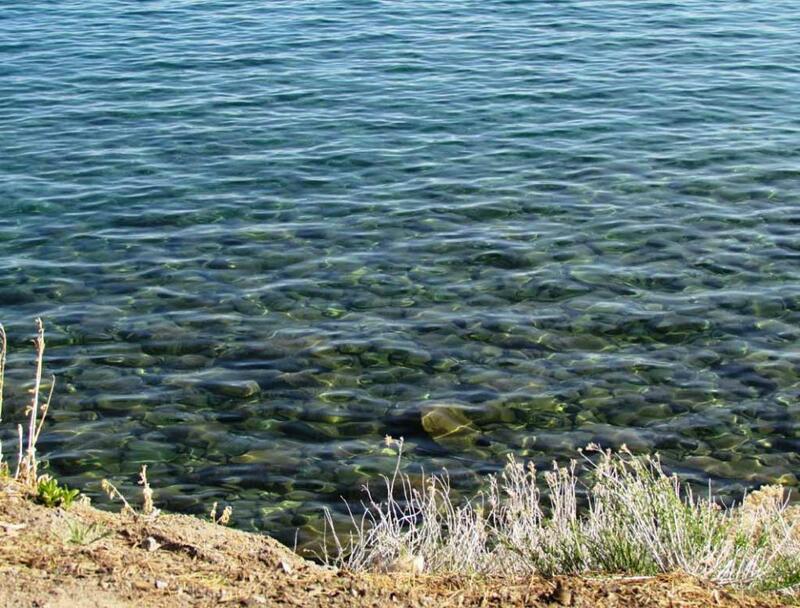 Crystal clear water in Lake Tahoe which is one of the purest lakes in the world. 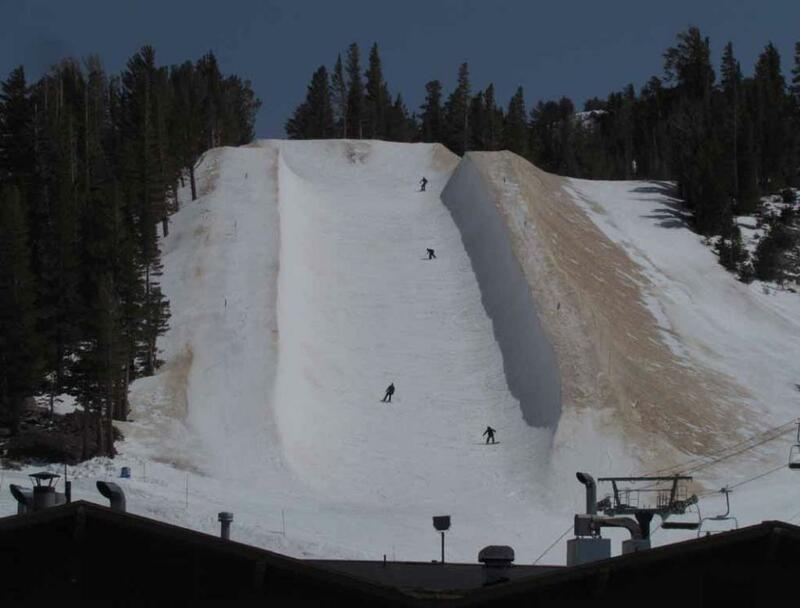 its size in the United States. 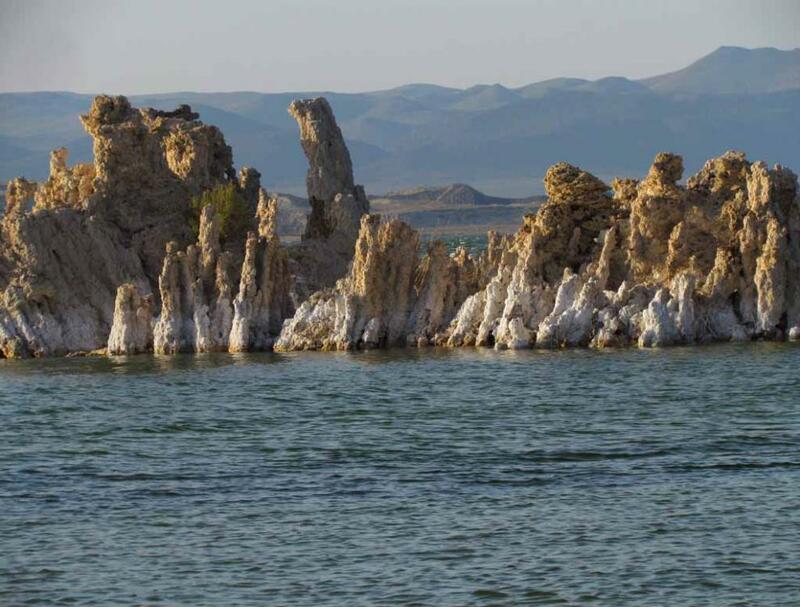 Magnificent Tufa towers, Mono's Magnificent Monuments, on South Tufa grove at south shore of Mono Lake. 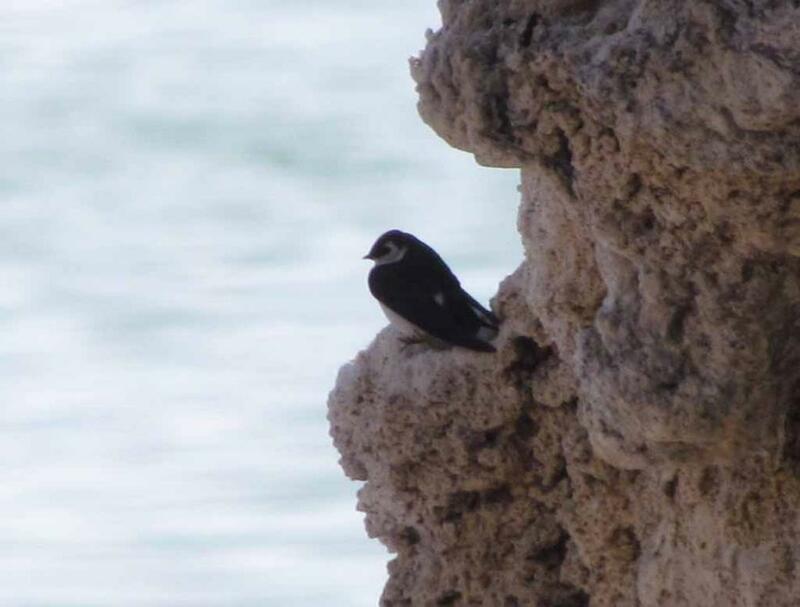 solid) around the underwater hot spring, and over the course of decades to centuries, a Tufa tower will grow. 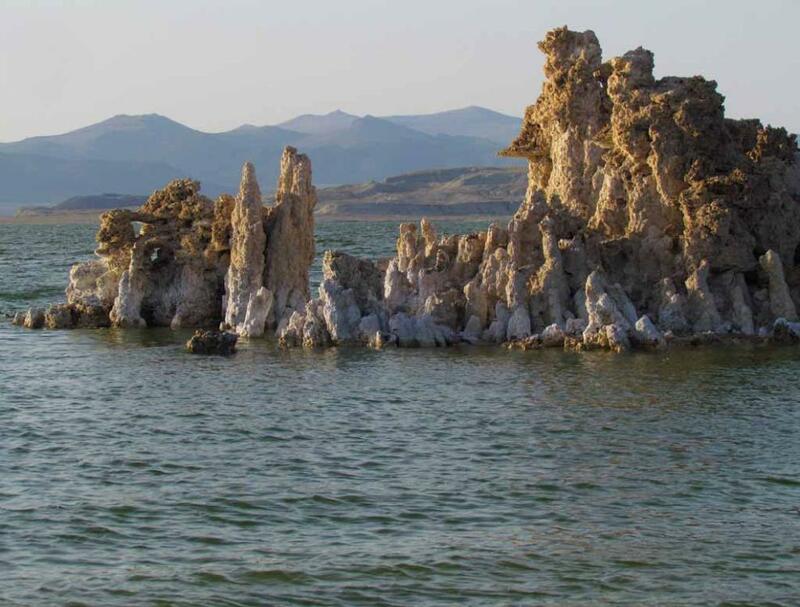 Tufa towers grow exclusively underwater, and some grow to heights of over 30 feet. 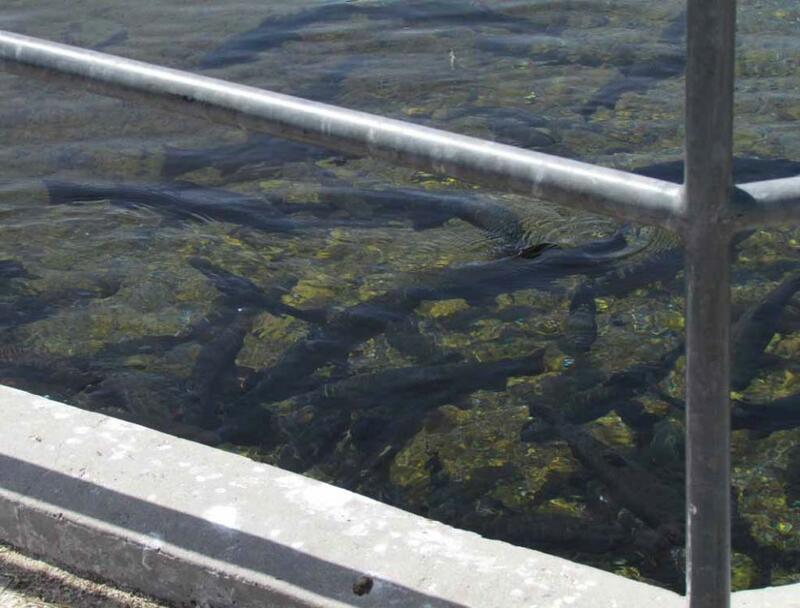 water level fell dramatically after water diversions by California Aqueduct began in 1941.
feeding frenzy such that the water surface looks like boiling. 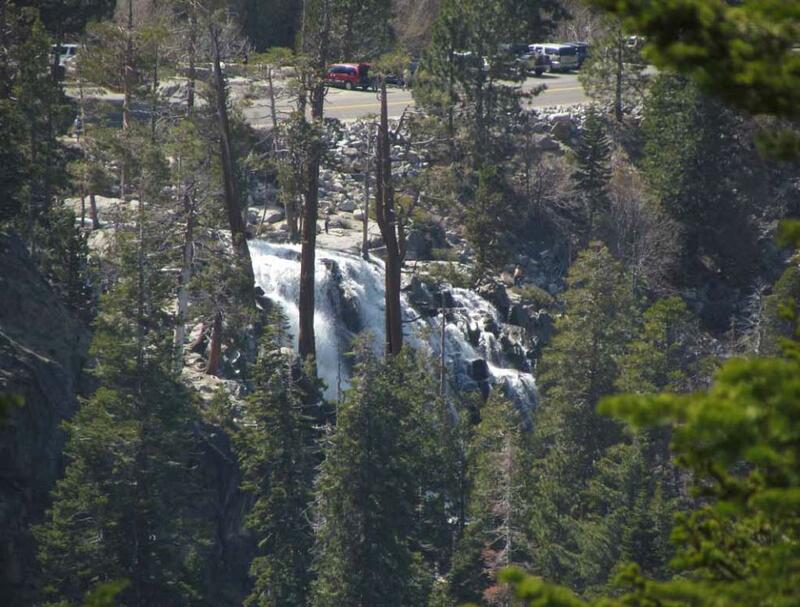 stream originates from the Eagle Lake about one mile to the west. 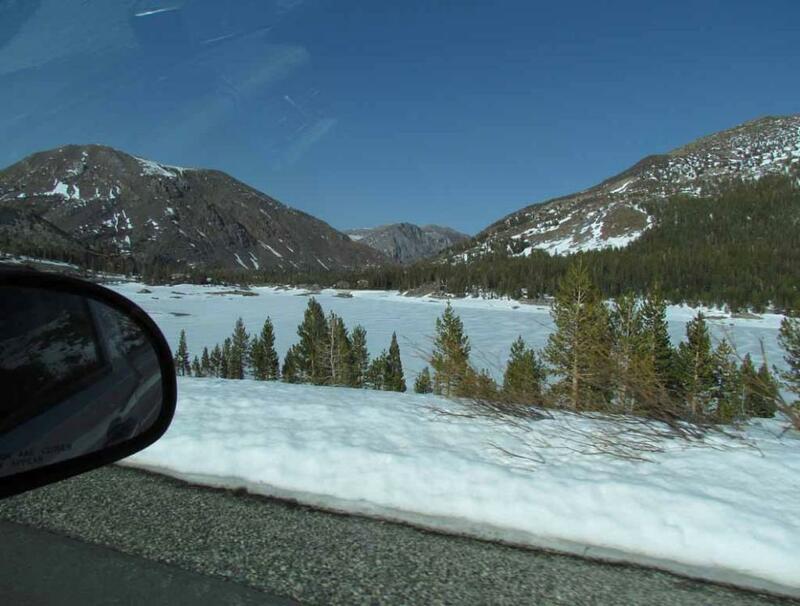 The frozen Tioga Lake along Tioga Pass Road. 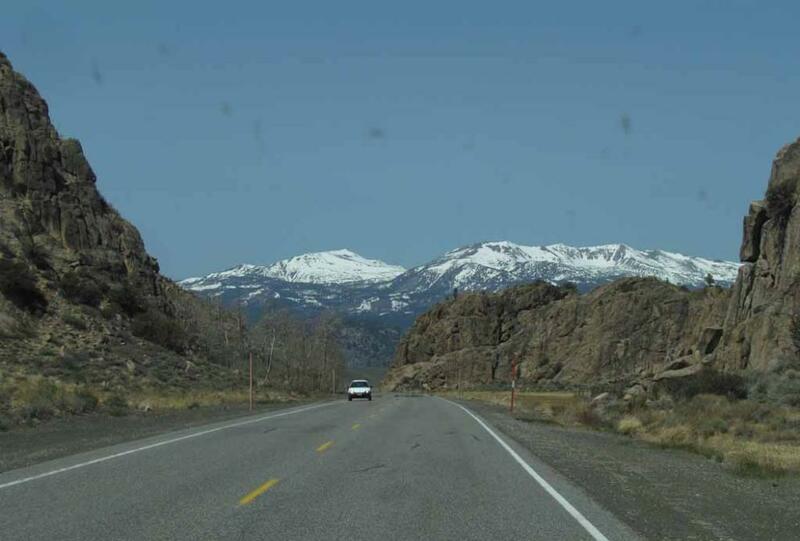 down to Lee Vining/Mono Lake to tour other parts of Eastern Sierra. 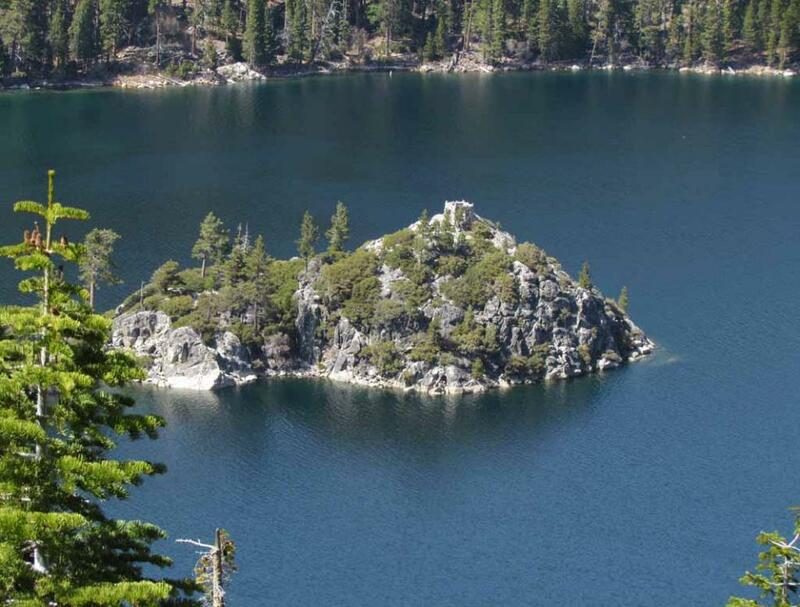 Zoom in on the Fannette Island, the only island in Lake Tahoe, and the Tea House on the top in Emerald Bay. 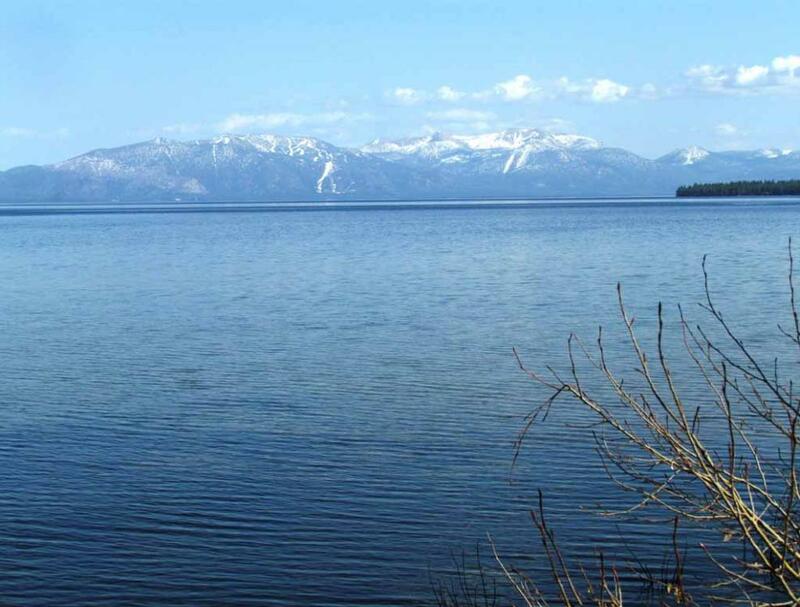 Gazing at Lake Tahoe with brilliant blue water from west shore. 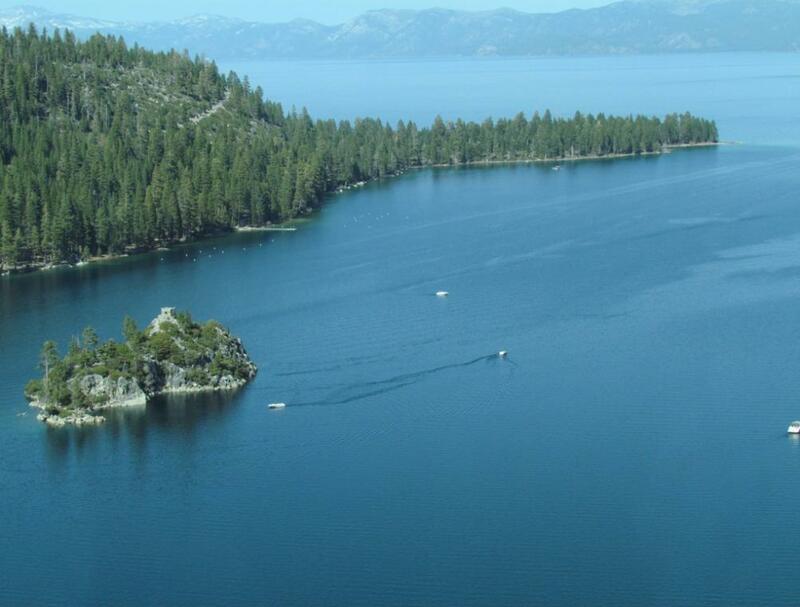 is the largest alpine lake in North America and one of the most blue pristine lakes in California. 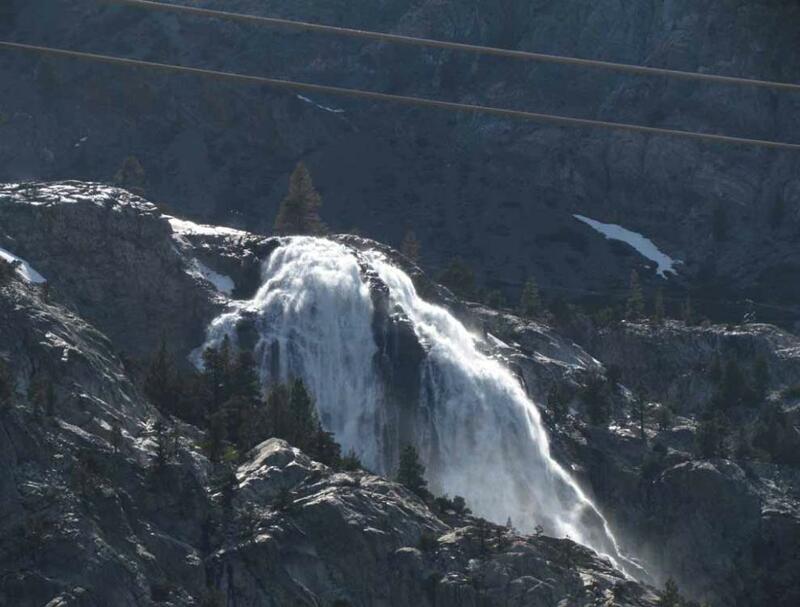 near the junction of SR 120 & U S 395 where Whoa Nellie Deli Restaurant and a gas station are located. 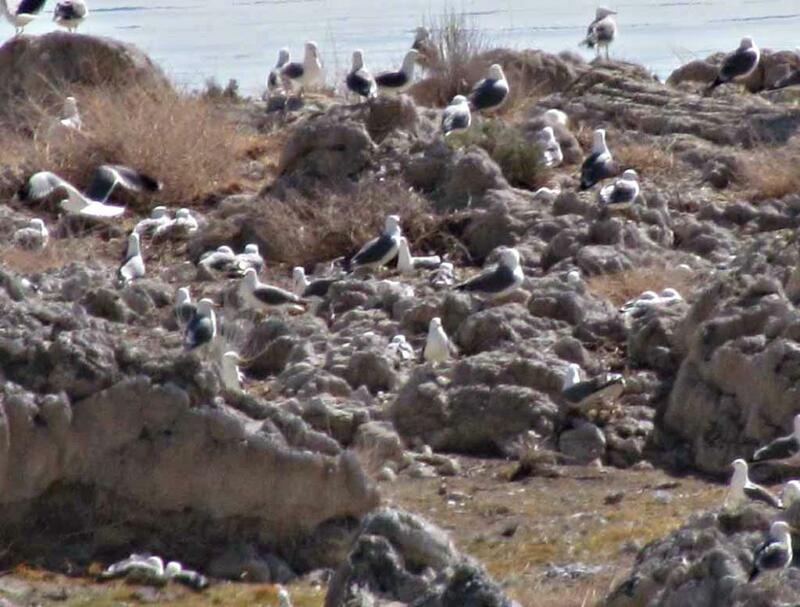 We toured the Mono Lake area in the late afternoon of April 27 and the morning of April 28. 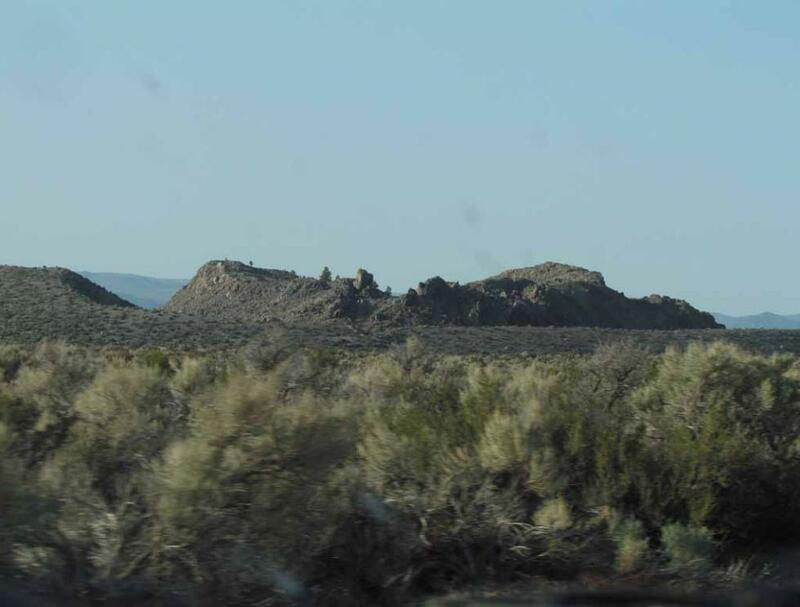 More Tufa towers in South Tufa grove. 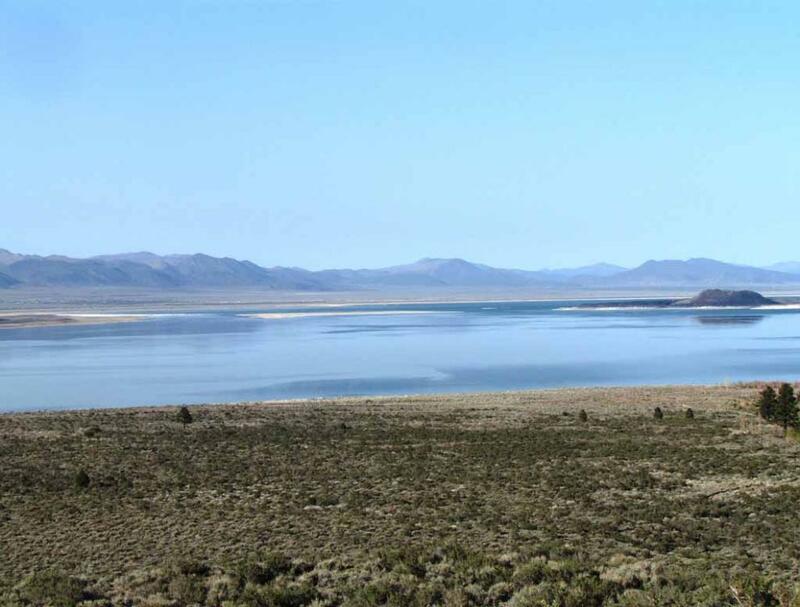 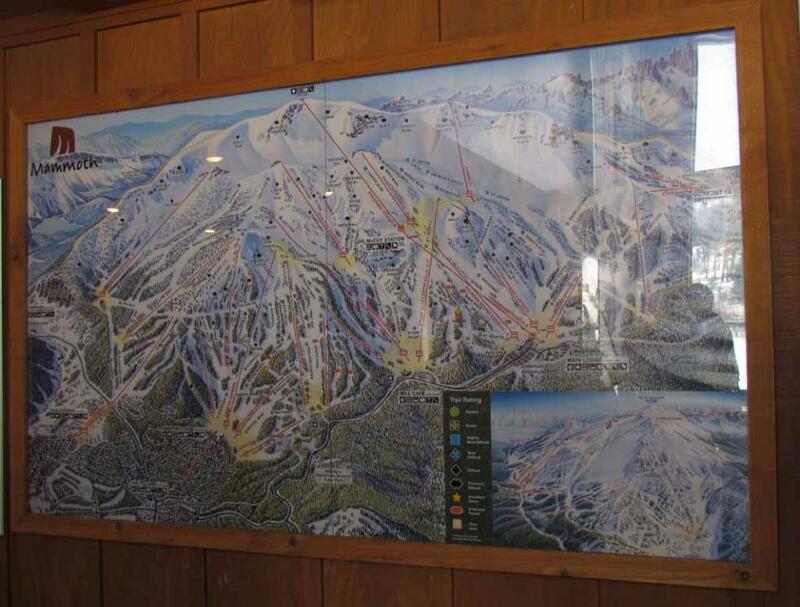 Map: Click here to see a local map of Mono Lake area. 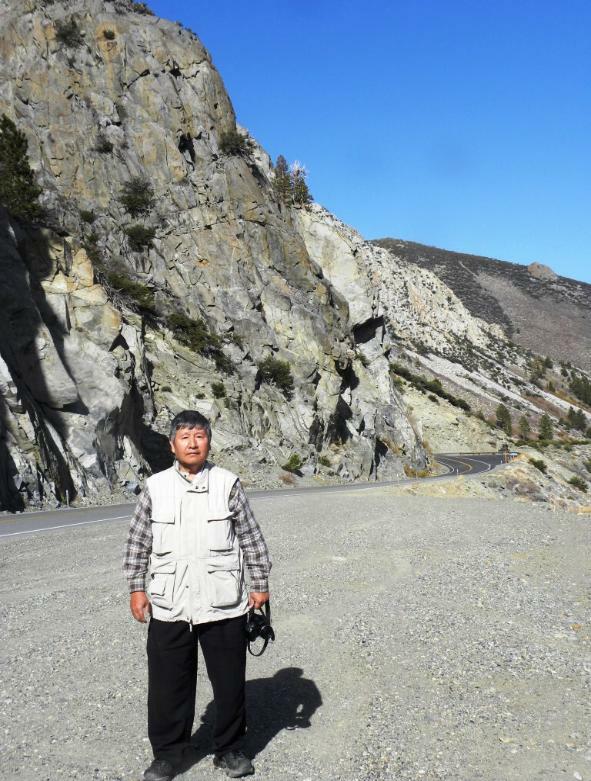 1 mile on this unpaved road to the parking lot of South Tufa grove. 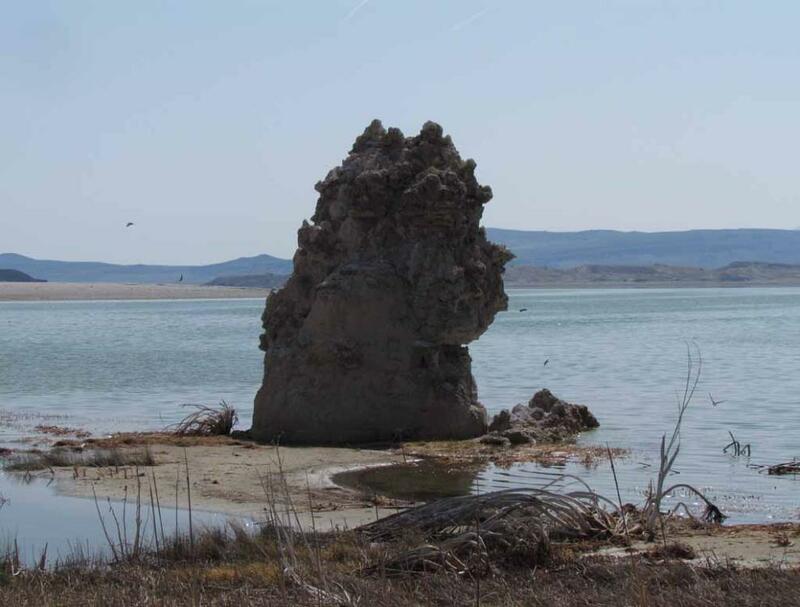 There is a one-mile loop trail for visitors to go near the shoreline to see these Tufa towers. 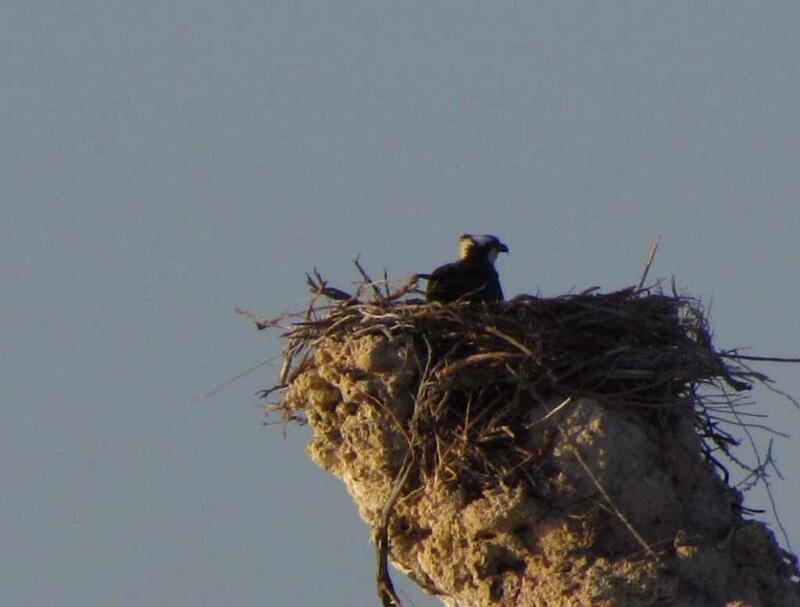 An osprey (fish hawk) built a nest on the top of a Tufa tower in south Tufa grove..
Four of many waterfowl on Mono Lake. 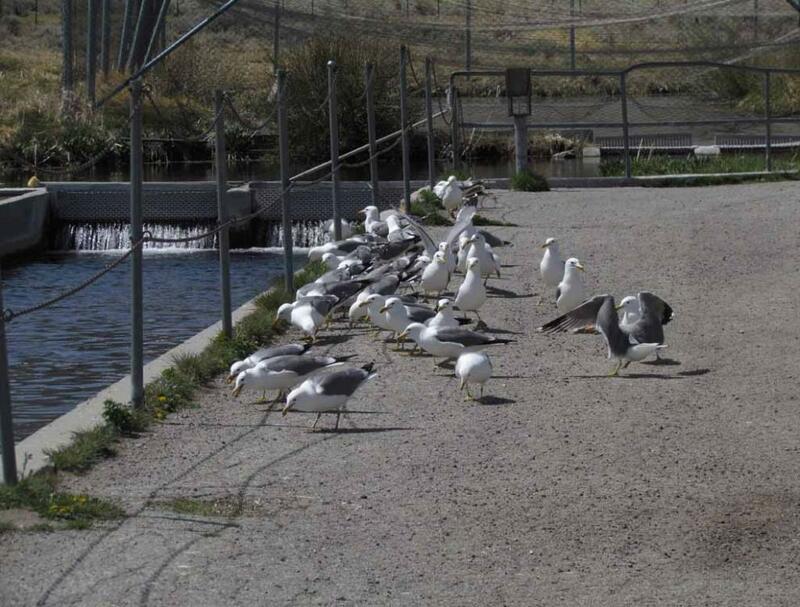 inlets after feeding because of the high mineral content of the water in Mono Lake. 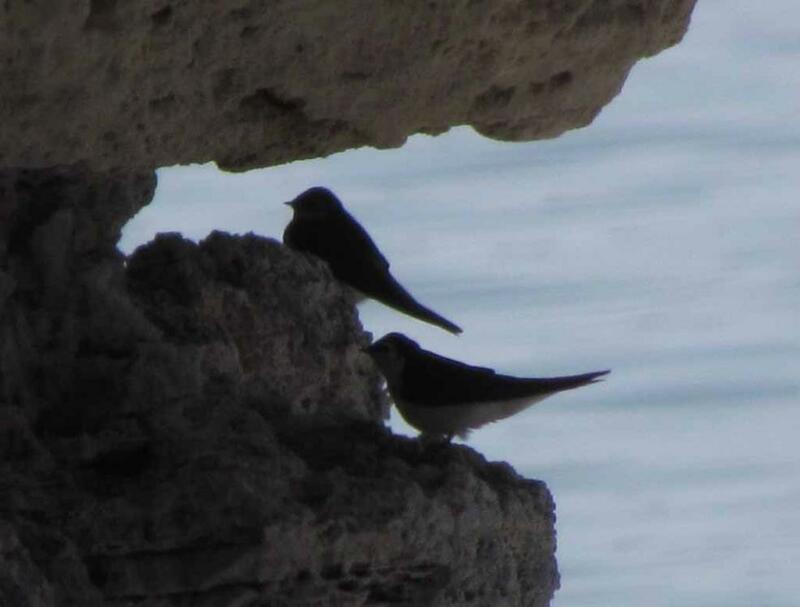 Swallows nesting on the Tufa tower. 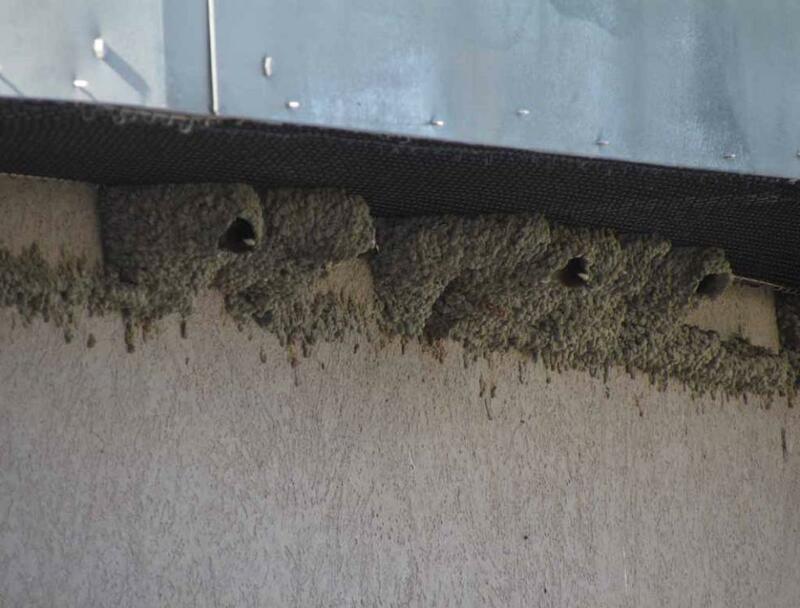 Swallows also built many nests on the Visitor Center of Mono Lake. 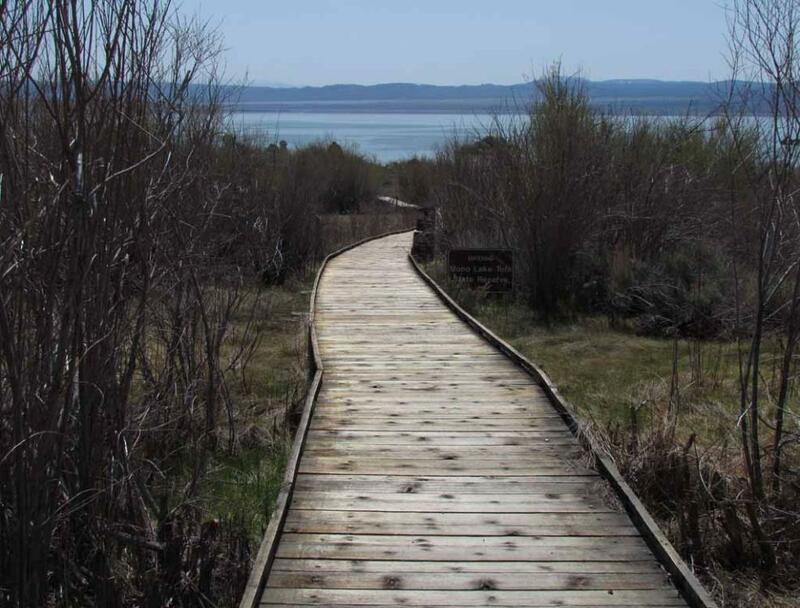 A board walk trail from Mono Lake (County) Park to the north shoreline of Mono Lake. 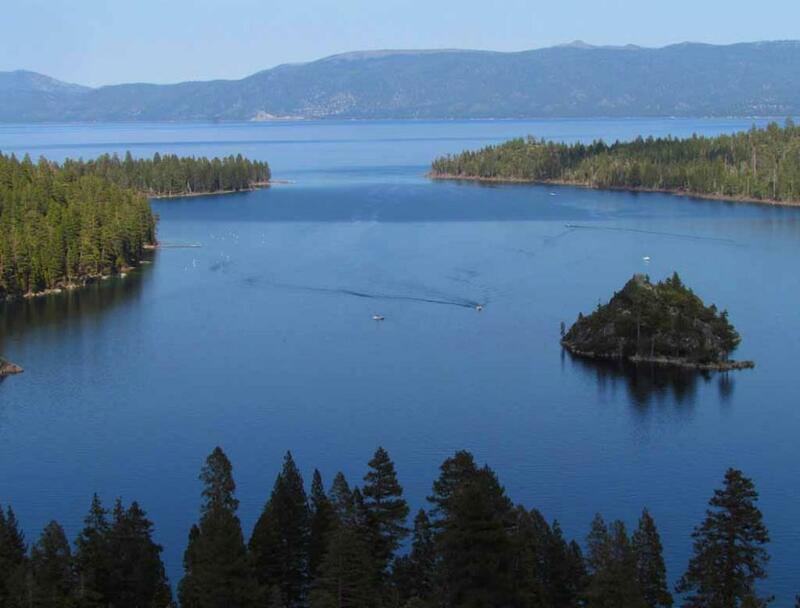 one can see Panum Crater on the left (north) side and several cinder cone craters on the right (south) side. 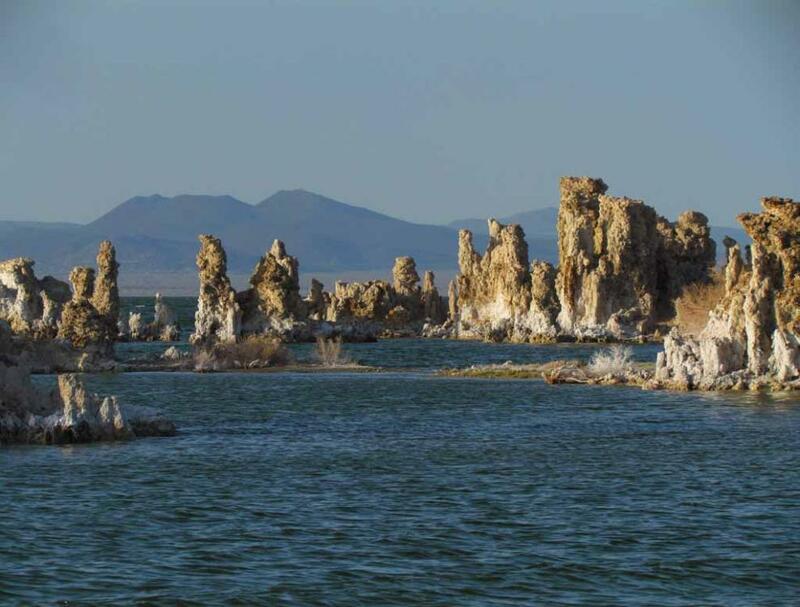 springs in Mono Lake creating those Tufa towers. 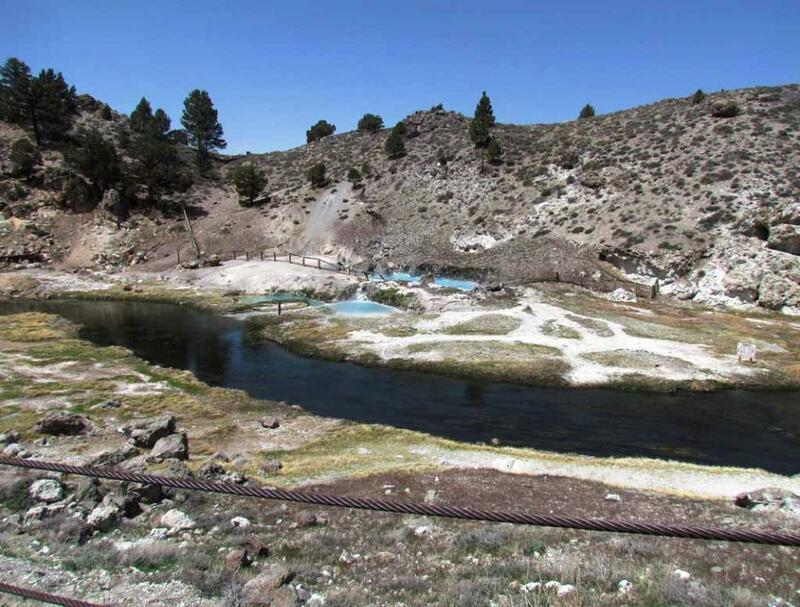 Steaming pools of hot spring at Hot Creek Geologic Site. 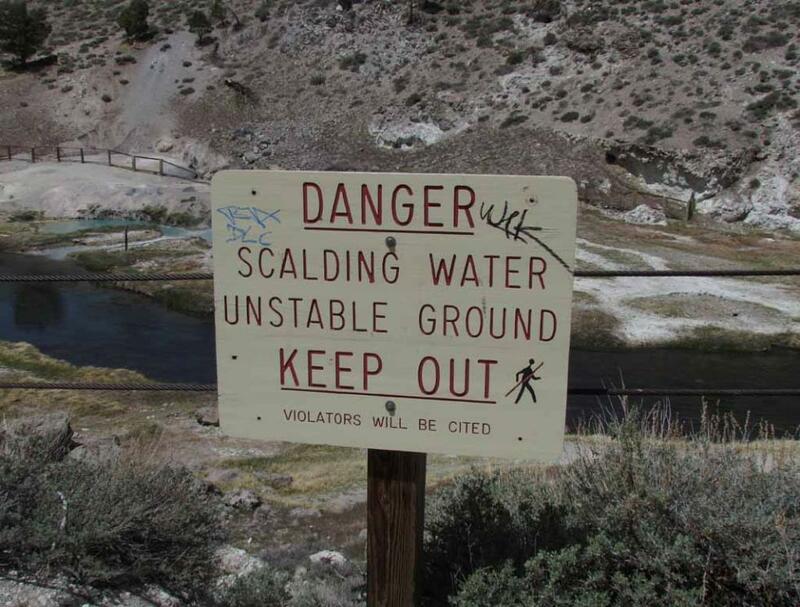 Warning sign of scalding water at the Hot Creek Geologic Site. 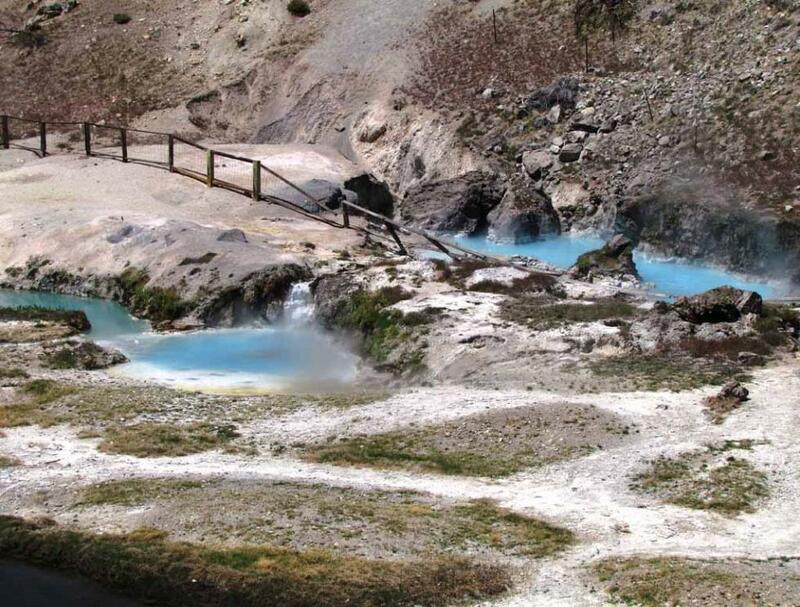 just one of many hot springs in this area. 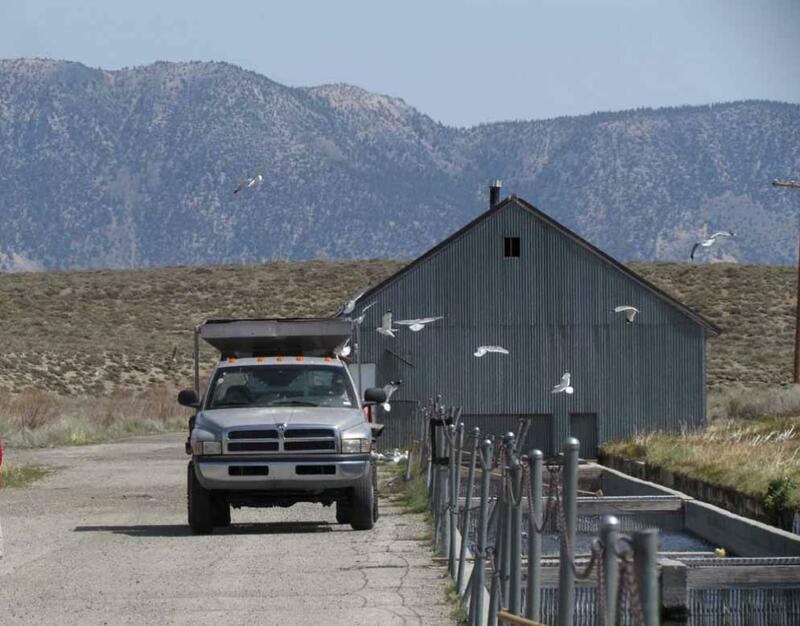 the right side of this truck. 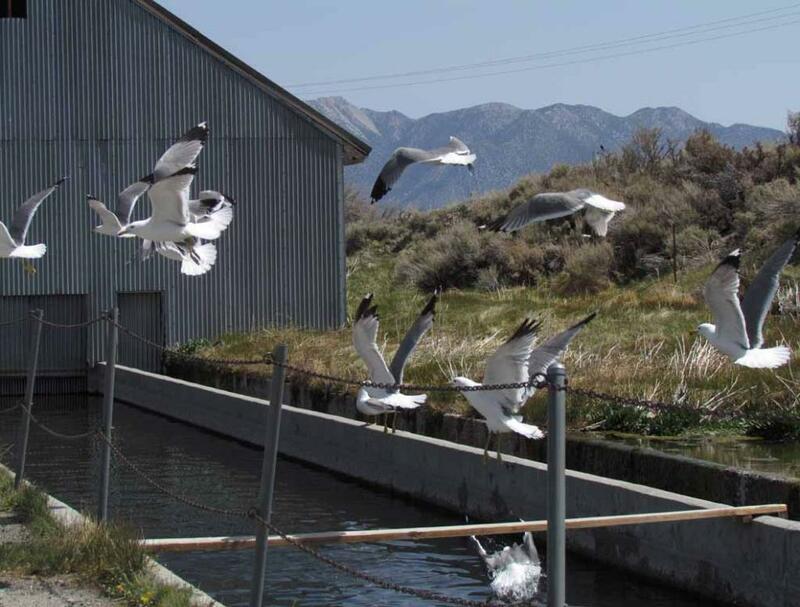 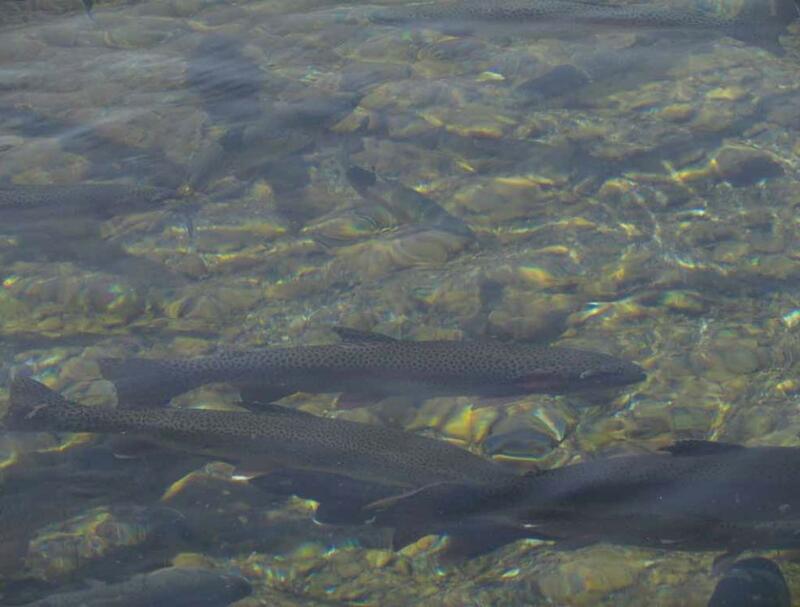 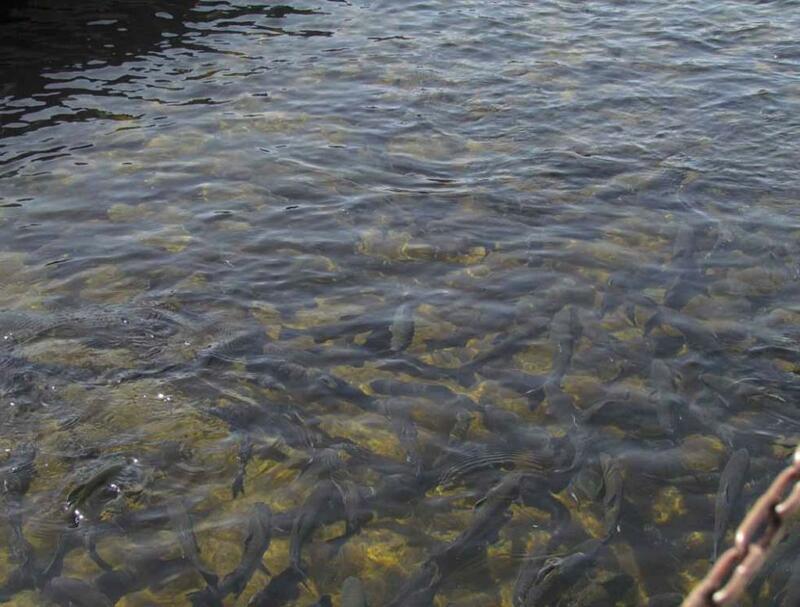 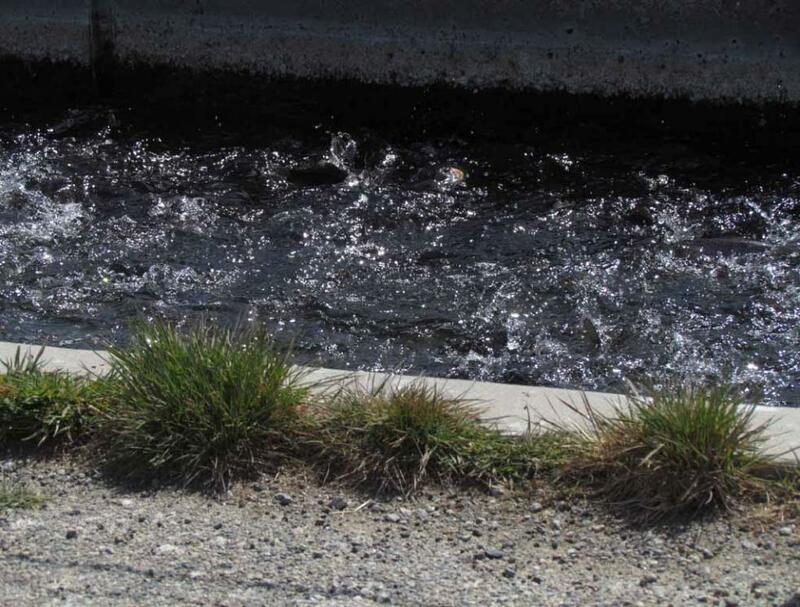 This is one of the three fish hatcheries near U S 385 when we were touring Eastern Sierra. 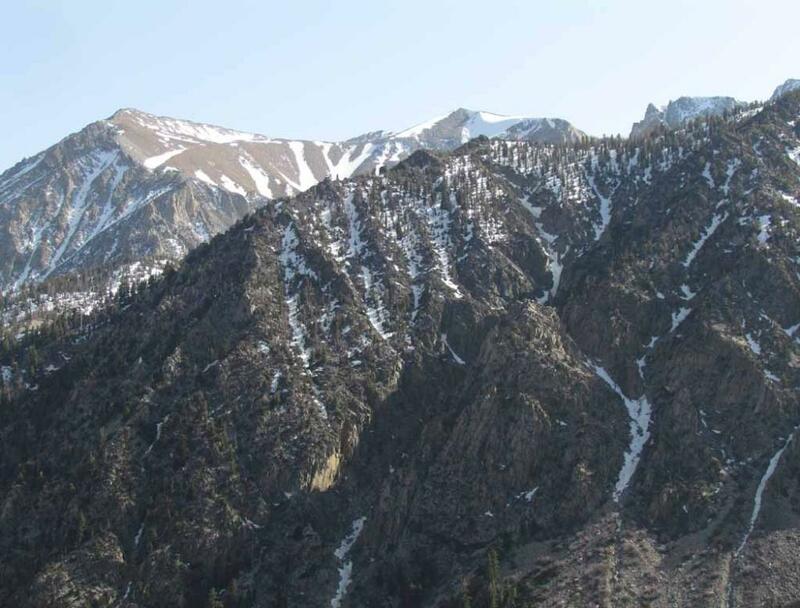 Vining Canyon which is a spectacular glacial canyon leading to the eastern entrance to Yosemite National Park. 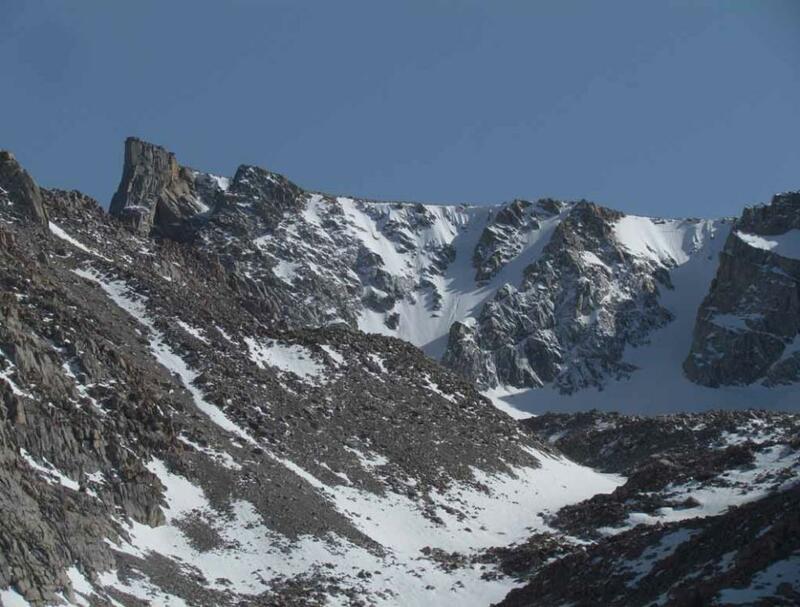 views of the rugged landscape. 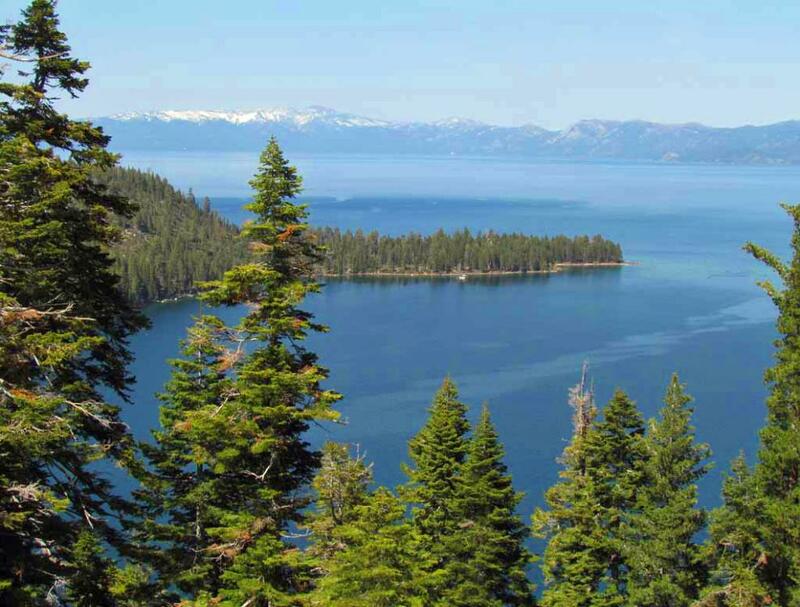 It has several pullouts for visitors to enjoy the fantastic views. 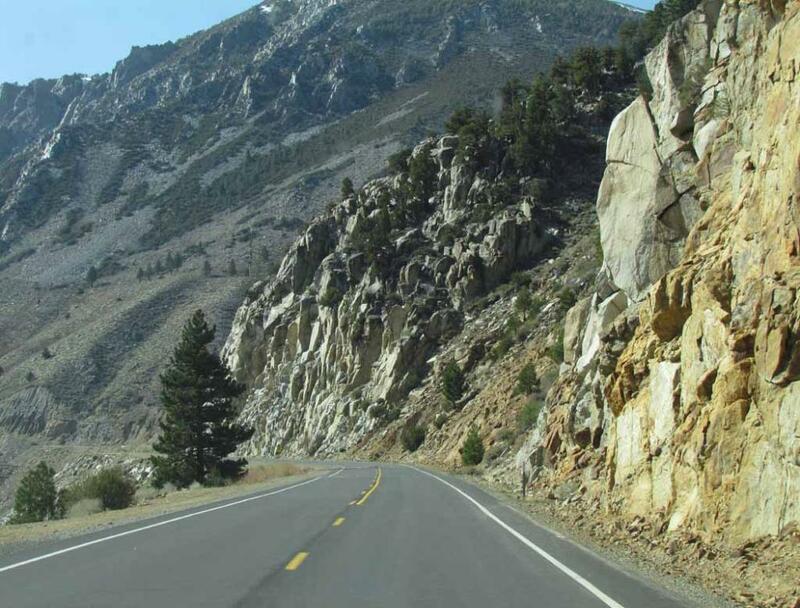 A section of the winding Tioga Pass Road climbing up the canyon. 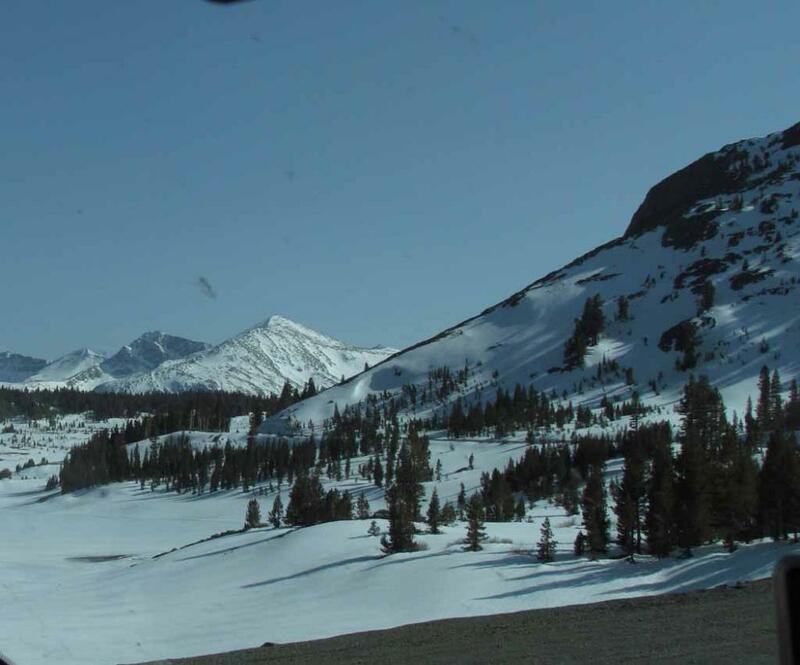 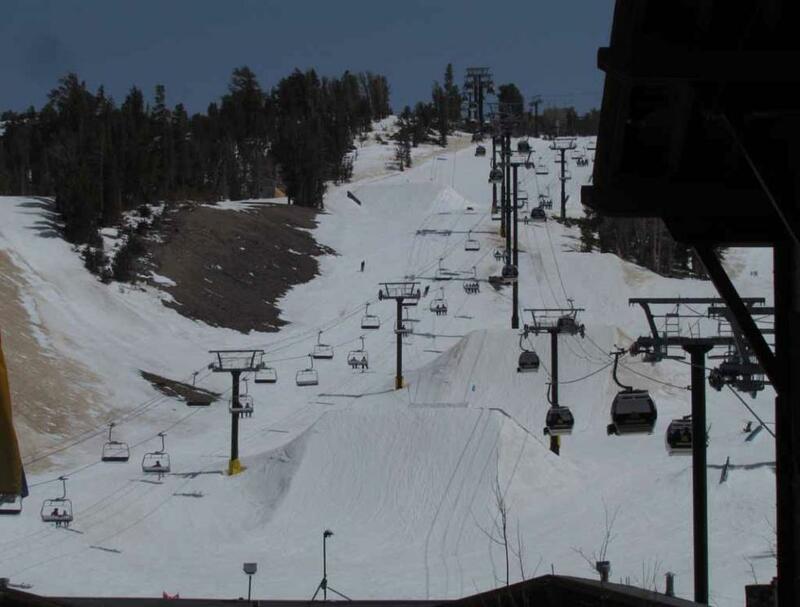 summit of Mammoth Mountain, from US 395 turn west into Hwy 203. 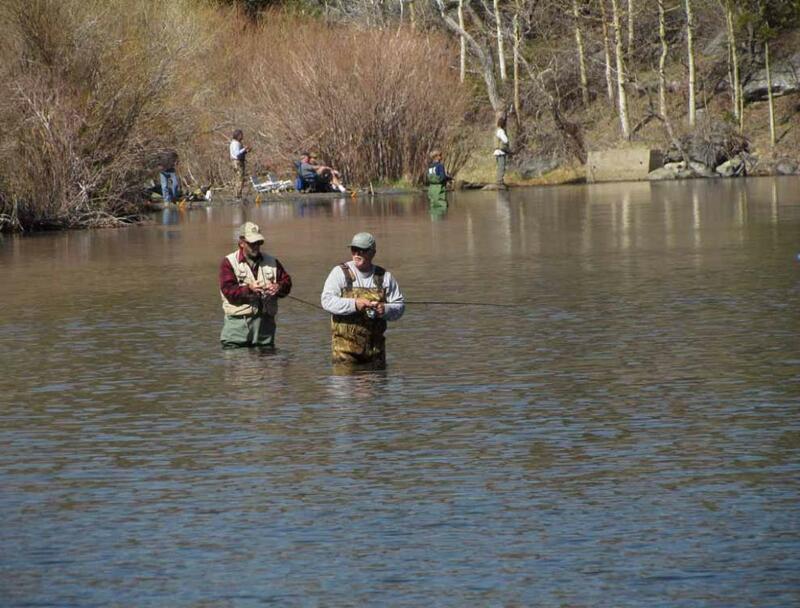 People fishing in Silver Lake in June Lake Loop. 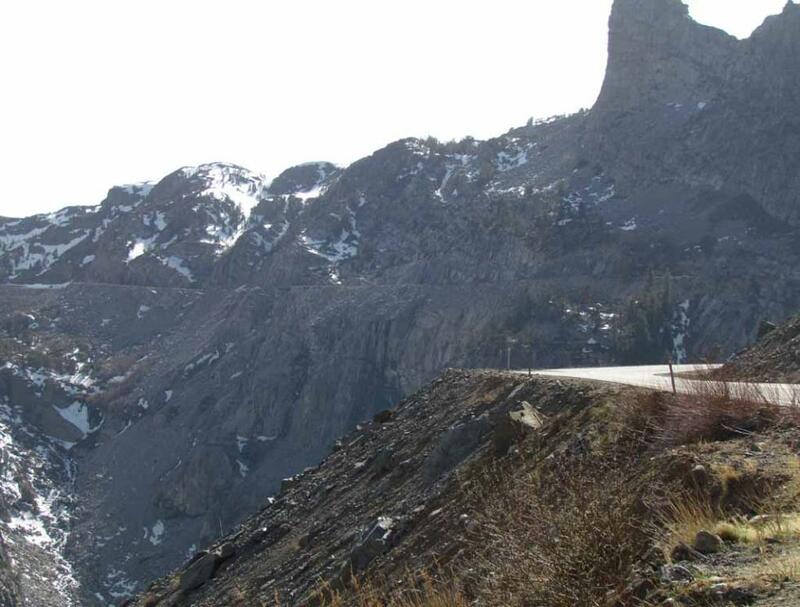 Devil's Gate along U S 395. 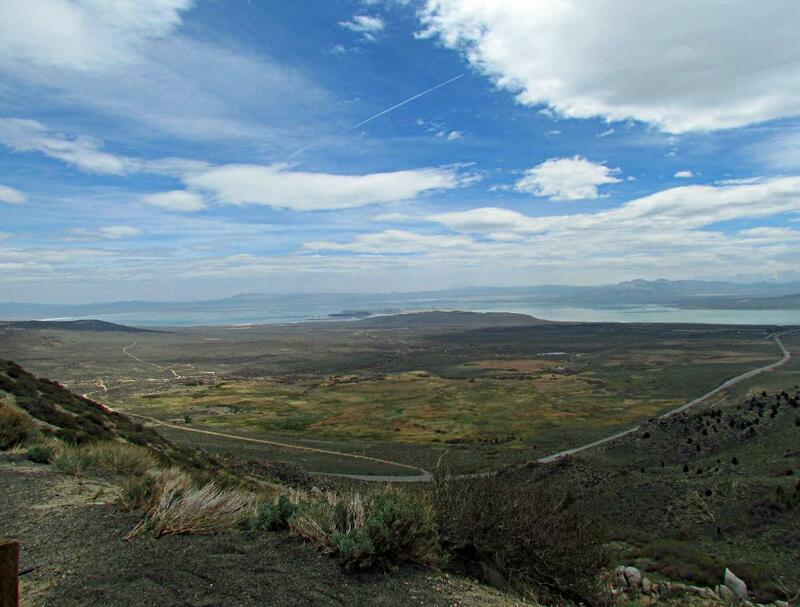 Turnout for Mono Lake Vista Point-2 just south of Conway Summit and on the south bound side of U S 395.
foot Inyo and White mountains to the east. 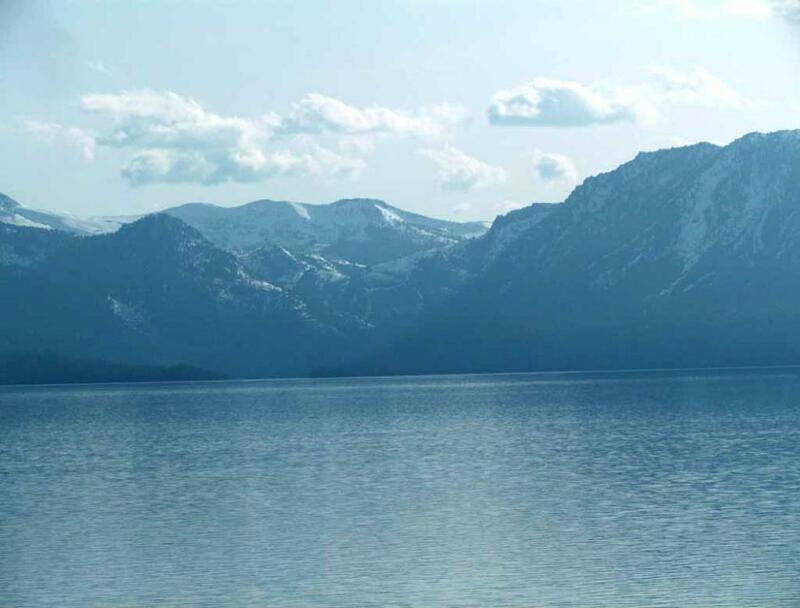 It was a very enjoyable drive. 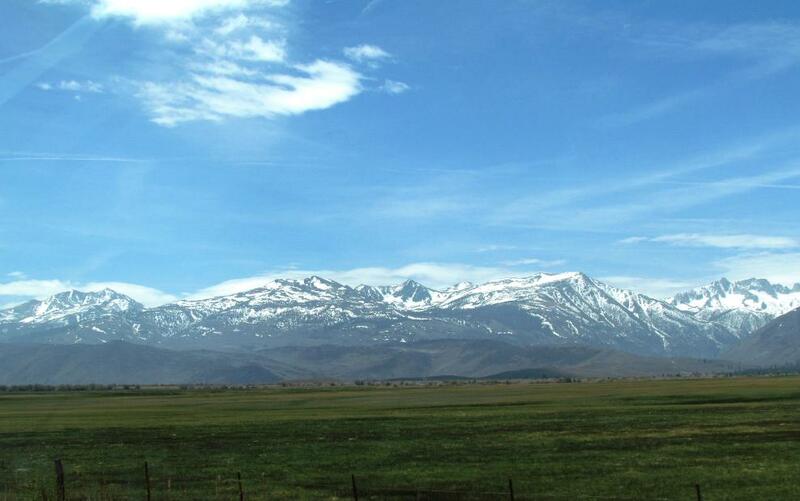 capped mountain range in eastern California as shown in this picture.